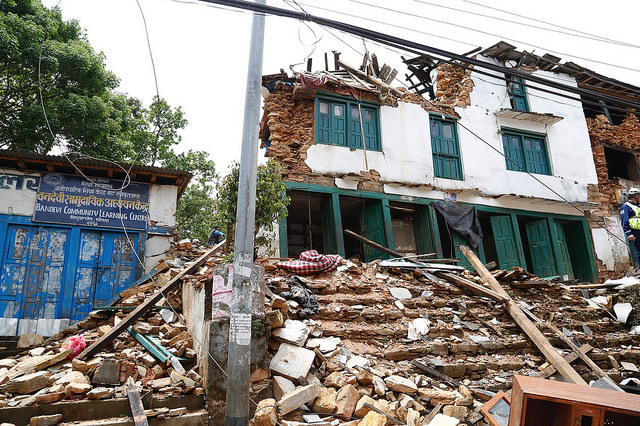 The European Union Delegation to Nepal hosted a regional conference on disaster risk reduction and climate change adaptation on Kathmandu, on May 26-27. The backdrop of the conference was the growing prevalence of natural disasters and increased vulnerability to climate change in South Asia. The conference was organized in collaboration with the International Union for Conservation of Nature and Natural Resources (IUCN), Centre for South Asian Studies, and DAI Europe. South Asia is one of the most vulnerable to natural disasters and to the impacts of climate change. At the same time, the region is home to creative initiatives which can inspire the rest of the world. With new international commitments, such as the Paris Agreements signed on April 22 2016, there is renewed momentum for more efforts. During the two-day conference, Government officials joined with experts, practitioners and journalists to share emergent solutions. Speaking as the Chief Guest, the Deputy Prime Minister of Nepal H.E. Mr. Bhim Rawal said that while all of us in the region are facing one or the other type of natural disasters, there has till date been very little done to put in place a regional response mechanism and a collaborative approach. “We need to redouble efforts among SAARC countries to carefully analyze, prioritize, plan and implement action plans so that there is appropriate information sharing amongst us,” he said. The conference dwelt on common challenges faced by the region such as the tsunami in Sri Lanka and Maldives, massive flooding in Uttarakhand in India and in Bangladesh, earthquakes in Pakistan and in Nepal and the regular episodes of humanitarian disasters and massive casualties despite of all efforts of the governments. Conference participants stressed the importance of shifting from a state of victimhood, into a harbour of best practices for the rest of the world. The media was also noted to play a role in disseminating and facilitating the implementation of strategies and programmes, as well as raising awareness among the public. Regionally, the effects of climate change have been felt in more ways than just natural disasters. Speakers also discussed on how climate change is impacting water and food security, and how women and the poor are often most vulnerable to the impacts of climate change. The European Union funds the Global Climate Change Alliance+ (GCCA+), benefittingsouth Asia,which operates on a total budget of €300 million worldwide to help ensure that those most vulnerable to climate change are able to increase their capacity to adapt to the effects of climate change. The European Union reiterated its commitment to continue supporting climate change adaptation and mitigation, as well as disaster risk reduction in South Asia and around the world. Overall, through this event, participants proposed new ways of moving forward into an uncertain future and a changing climate. Bringing together key people from around South Asia proved to be a successful way of fostering mutual learning. We hope the discussions of the Conference will soon transform into action so as to prevent disasters and promote inclusive and sustainable development.